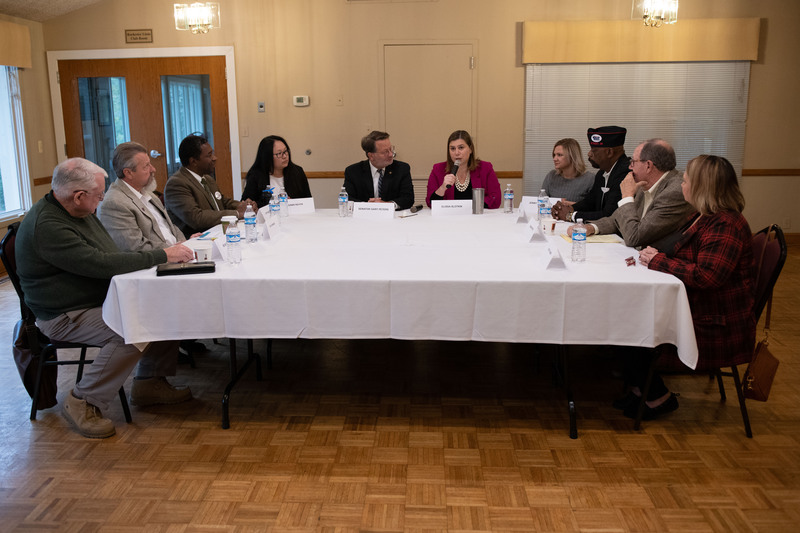 Democratic contender for U.S. House of Representatives District 8 Elissa Slotkin and Senator Gary Peters held a roundtable discussion at Rochester Community House on Monday to discuss veterans issues. Slotkin and Peters were joined by both veterans and experts in veterans’ services to discuss what Congress can do to better support the men and women who served in the military. “This is an event that is close to my heart,” Slotkin said. She credited her time as a CIA Analyst in Iraq as what motivated her to run for office. “We just felt that the tenor and tone of politics had become fundamentally unbecoming of the country that we served and the country that we all love,” Slotkin said, speaking of herself and her husband, who served in the U.S. Army. “We need folks with her kind of experience,” Peters said. The discussion focused on employment opportunities and health care services for veterans. One of the issues discussed was helping veterans translate their military skills to relevant workforce skills. Panelists discussed the challenge of showing employers how military training applies to civilian jobs. “What we find, often, is that veterans just don’t know the opportunities that are out there,” Cliff Hodge, an army veteran who volunteers for Veterans for Elissa Slotkin, said. “There’s nothing that says when you go to get a job, ‘This is what you need to do.’” Jenny McCardell, a Navy Hospital corpsman veteran and member of the Rochester Hills City Council, said a similar disconnect exists between military experience and higher education. “The bottom line is that translation is not happening at the level it needs to be happening,” Slotkin said. Veterans are up against a lack of information when it comes to getting healthcare, too. “They just assume there’s nothing out there,” Dennis Ritter, a U.S. Army veteran, said. Others advocated for more interconnectivity between veteran healthcare services. “We could all do a lot more if we just coordinate and collaborate our systems together,” Tyrone Chatman, the CEO of the Michigan Veterans Foundation and a U.S. Army veteran, said. “That’s our biggest issue, getting the information out there.” The panel also discussed mental health issues. The panel agreed that making sure veterans are properly diagnosed and getting them the help they need is key. Slotkin is running against Republican Congressman Mike Bishop to represent Michigan’s 8th Congressional district. This race is one of the many that voters will decide on in the November 6 general election. Want to know what your ballot will look like? Visit the Michigan Voter Information Center at webapps.sos.state.mi.us/.